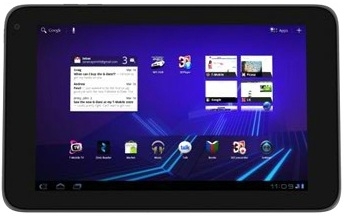 "T-Mobile is ready to re-position the T-Mobile G-Slate as one of the best tablets on the market given its recent price drop. According to this internal document T-Mobile is claiming that they have received “legal approval” to “definitively” state that the G-Slate is more than “2x faster than the iPad2 on AT&T and Verizon, and over 3x faster than the Motorola Xoom.”"
T-Mobile is referring to carrier data speeds here. Marketing the LG Slate based on it's "4G" connectivity is a questionable move because the G-Slate can only do 14.4Mbps, not the full 42Mpbs that T-Mobile's 4G network is capable of. Also, they're comparing to a 3G Xoom which will get upgraded to LTE at some point. I think it would be a better idea to market the G-Slate based on it's price and features. To me, a $400 tablet with an 8.9" 1280x768 3D display, 1GB of RAM, 32GB of storage built in, 5MP rear cameras for 3D, a front 2MP camera, and 1080P 2D recording with Honeycomb all for $400 on contract sounds like a great deal to me! What are your thoughts? Do any of you have the G-Slate? Does the carrier network connectivity speed make that much of a difference to you on a tablet?